Pat calls. "I have your money for you." "Yes, I told the people at the church what happened and they all chipped in and gave me the money. I'll give it to you on Tuesday when you take me for my MRI." "Stash it someplace safe in the meantime. Don't lose it again." I'm putting my collection of Thanksgiving pilgrims away and gathering Christmas decorations from the garage. I'm trying to forget that I look like I've been in a knock-down, drag-out fight. Hope no one comes to the door or calls me on FaceTime. I won't answer, either way, if they do. Good thing about The Jazz. She doesn't seem to notice or care what I look like. She purrs and cuddles with me on good days and bad. Irene calls. "Dede, thank you for the beautiful Thanksgiving e-card. I just opened it. Am I calling at a good time to talk?" "I want to let you know that Ed passed away on Thanksgiving morning. All the family were gathered in his presence. It was very peaceful and he didn't appear to suffer. It's too soon, of course, but I'm glad he didn't linger. He wouldn't have been good at lingering." "I'm okay. Both of my girls are here with me and I couldn't have made it without them. I go in for more MS treatment on the tenth. There are many decisions to be made. Ed will be cremated and his ashes will be scattered beneath his favorite oak tree on the ranch. I'll put the house on the market in the spring. Eileen wants me to come live with her in Grass Valley. I may do that for a while, but I need full-time assisted living. I'll be looking for a facility I can afford that has some residents in my age group. It's a bit overwhelming. I'll stay with Eileen for a few weeks while I sort through some of these things." "Irene, when you're in Grass Valley, let me know. I'll drive there to see you." "I will. How's everything with you, Dede?" "At this moment? Everything's okay. I try to take one day at a time. Thank you for calling. And please Irene, take good care of you." I'm at the dermatologist's office. He looks at my swollen eyes. "Your eyes are much worse than the last time I saw you. I'm stumped. This problem is more of an internal medicine problem. You should see the allergy doctor." I'm with the allergy doctor. He's showing me photos of people with swollen eyes on his computer. "We have to figure out if this is an outside-in problem or an inside-out problem. I'm ordering some blood tests to determine your thyroid function. Orbital edema is one of the least understood diseases on the planet." "Whatever explanation you offer for your swollen eyes, I guarantee that the theory's already been studied and found lacking. If you want to get a Ph.D. in this illness, medicine will thank you. This occurrence is idiopathic, or of an unknown cause. Meanwhile, another option is to start a course of prednisone. It will be hard on your bones, but if I were in your shoes, I'd opt for the prednisone. You are, medically speaking, becoming a complicated lady." Hmm? Usually, I think "complicated" sounds interesting. Not this time. Home again. I'm discouraged. I look like some kind of freak with huge, swollen eyes and enormous bags of fluid hanging down my cheeks. Have to keep this in perspective. I'm sure most folks would think mine is a minor problem, compared to MS or to dying. Santa, all I want for Christmas are two normal looking eyes. PATRICK'S FACEBOOK POST: I know I should take it as a compliment, but getting carded at the bar when you're ordering a beer and you're well into your forty-fifth year is getting a little tiresome. I'm picking Pat up to drive him to Kaiser for his six-month MRI. I try not to think about why we're doing this. It's to check if his brain tumor is returning. I wonder what he's feeling when he goes through the procedure. Fear? Worry? Like a time bomb's about to go off in his head? When he gets in the car, he takes out a wad of dollar bills. "All from your friends at church?" I never cease to be surprised by this son of mine. And by people in his church. Home again. I'm taking prednisone, Benadryl, and non-aspirin acetaminophen, trying to fix my itchy eyes. I email the allergy doctor. "Anything else I can do for this itching?" He emails back. "Wash your eyelids twice a day with warm water and no tears baby shampoo to remove any irritants. All the blood tests are coming back normal. As we discussed, it's idiopathic angioedema, or no known cause." I have to remember this word. Next time I have to explain why something's happening that I don't understand, I'll say, "It's idiopathic. It's occurring spontaneously. I don't know why." I don't have to know why. It's a foolproof answer for whatever you need a foolproof answer for. It covers all the bases and gets you off the hook. PATRICK'S FACEBOOK POST: Tried very hard to hear the music in the industrial noise of an MRI of the head, but there's no music to be found there, it's just horrible noise. Nelson Mandela is dead at 95. One commentator says, "Some leaders are respected. Some are loved. 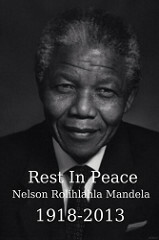 Mandela was both loved and respected around the world." How long does the influence of a world leader last? Will South Africa remember Mandela's example? Already there's talk that the integrity he modeled is coming undone. Scandal, greed, and political corruption are reported in his homeland. Is it inevitable that we regress when an icon no longer stands before us? Mandela thought for himself. He was pragmatic. Nonviolent resistance was not an inviolate principle for him. When nonviolent resistance didn't appear to be working he promulgated a course of limited violence. "There is no moral goodness in using an ineffective weapon," he wrote in his autobiography. Yet, when the burden of decision-making was upon him, Mandela often used other tools in his toolbox. He chose forgiveness and reconciliation. Mandela honed his ideas and his values during 27 years in prison with lots of time to think. A convergence of time, circumstance, and character gave his life historic meaning. He didn't nudge the world. He shoved it. PATRICK'S FACEBOOK POST: Glad I had the chance to hear him speak in Oakland. R.I.P. Nelson Mandela. I'm stocking up on staples at the local discount grocery outlet — getting ready for Christmas week and the marathon of holiday meals. I'm culling my recipes and making selections. I'm at the check out register. My total is $168.83. For this amount, I get black beans, white beans, garbanzo beans, kidney beans, bread, soups, canned tomatoes, assorted shredded cheeses, tuna, evaporated milk, olives, cottage cheese, peanut butter, pasta, Tabasco sauce, Worcestershire sauce, cereal, walnuts, almonds, lemon juice, sour cream, sausage, sugar, flour, baking soda, Canadian bacon, and cat food. The list doesn't include perishable fruits and vegetables which I'll go back for next week. I'm heaving eight heavy bags from my car to my kitchen. By the time everything is put away, this will have been a half-day's undertaking. It's 10 p.m. and I'm in bed for the night. It's 37 degrees outside and a heavy rain is falling. I hear it thudding onto the bark in my backyard. I pull up the red blanket I throw on top of my quilt. I'm warm and toasty under the covers. I give thanks for this comfort. As I rest my head on my pillow, I close my eyes and imagine looking through the plaster ceiling, through the cement tiles on the roof, through the cloud cover, and into the dark, endless expanse of the universe. I breathe in and out. I'm one with what is. I fall asleep. At 2:30 a.m., I'm wide awake. Prednisone is reducing the swelling in my eyes, but it's revving me up and interrupting my sleep. Canadian geese are flying over. They're squawking back and forth. Where are they flying in the dark, in the rain? Are they looking for shelter? Are they looking for food? I remember the staples in my cupboards. I consider abundance and hunger. I don't go back to sleep. I was supposed to play bridge in an all-day regional tournament today. A new bridge partner has to cancel. Her daughter has bipolar disorder and lives at home. Her daughter's going through a rough patch. She's talking about not wanting to live. "We can't leave her alone." This friend comes to the family mental illness support group. Our December meeting will be next Friday. I'll send out a reminder and ask for an RSVP. With the holidays, people may be too busy or out of town. Or, with the holidays, there may be greater need to convene and support each other. Holidays can increase stress, push buttons, pull triggers. It's still raining. Oh, my gosh, it's snowing. The black bark in my yard is turning white. I'm cocooning. I'm turning on the Christmas tree lights, lighting candles, and heating the oven — getting ready to bake banana bread to put in the freezer. I'll call my friend, later, to see how her family is doing. Maybe the falling snow will provide a quiet distraction — a meditation on things bigger than ourselves. PATRICK'S FACEBOOK POST: First sign of the apocalypse: local grocery store discontinues Heinz 57 steak sauce. Found a flash drive in my winter coat pocket that I was certain I had lost in a public computer room. It contained some very private data so glad I found it. It's actually snowing here. Rare. I'm sitting here staring at the computer screen as if something wondrous is about to crash through the glass. A brilliant thought? A novel idea? A 3D-living-technicolor manifestation of my awesome mind at work? Writing pundits say, "You have to show up." Show up or you might miss the moment an inspiration bursts into view. Right over your head. Like a cloud with a candle in it or something. So here I am. Waiting. Watching, Wondering. Thinking about that box of dark chocolate marshmallow Santa Clauses stored in the garage. I bought the candy to be Christmas after-dinner treats, but they've been delivered too soon. There were 18 in the box and they're disappearing one at a time. There are nine left. I need twelve. I'm short three. What to do? I could order more but I bought them on sale and now I'd have to pay full price. And the timing would still be off. They need to arrive right in time for dessert on Christmas Day. Not a moment too soon. I could have them delivered to a friend's house. I'd ask her to bring them over with an invitation to join us for dessert. This plan has defects though. Which of my friends is trustworthy enough? Which doesn't like dark chocolate covered marshmallow? Which has nerves of steel and oodles of willpower? None of them. We're all wimps. There's another plan coming into focus. Plan B. I could skip the dark chocolate marshmallow Santa Clauses altogether. It's not like I've announced them already. I could serve peppermint ice cream with chocolate sprinkles and who the heck would know? And since nobody would know, nobody would be disappointed. I wouldn't have to bother a friend to store the Santas and deliver them. I wouldn't have to worry about the timing thing. There'd be no reason not to go into the garage right now and take one Santa out of the box. The more I think about it, the more I'm liking this Plan B. It makes a lot of sense. The writing pundits are right. I'm glad I plopped myself down in this desk chair, glad I sat waiting in silence, glad I didn't let a blank computer screen scare the you-know-what out of me. If I hadn't shown up at my computer today, I'd have missed this inspiration, altogether. PATRICK'S FACEBOOK POST: You have reached the end of the internet. Turn around and go back. I'm at Snap it Up for my Tuesday morning shift. People come in the door one and two at a time. It's a steady stream this morning. The first customer says, "I'm buying these clothes for my sister. She and her long-time boyfriend broke up. She's wearing his clothes and he's wearing hers." "Can she go to his house and pick up her clothes?" "No, it's a volatile situation. I'm trying to stay out of it, but she needs some winter clothes. She's wearing summer stuff." Another woman's found three strange looking red cords. I don't know what they're for but she does. "They're Christmas lights. Please plug them in and make sure they work. I've lost my job and I have to be careful spending for Christmas." All lights light up. Three light sets sold, fifty cents each. I show a small, petite lady the dressing room. She's holding a brand new pair of Gloria Vanderbilt jeans. I think they look a little big for her. She better try them on. A woman with a walker hands me a denim jacket, a headset, two Christmas wine glasses, a lavender and peach scarf, and a green bracelet. "I'd like to see that lavender beaded bracelet in the counter, too." The bracelet's three dollars. She clasps the bracelet on her wrist. "I really like it. I better not. I have to make the check I got today last the rest of the month." I tell her maybe her luck will hold and the bracelet will still be here next month. Damn. Wish I'd t thought to offer it to her for half-off. A young girl asks, "Do you have any ugly Christmas sweaters? My brother needs one for a work Christmas party." We search both the men's and women's racks. No ugly Christmas sweaters. "Let me look in the back and see what's come in." I find three ugly Christmas sweaters — all large women's cardigans. The girl's eyes get big. "Let me go get my sister-in-law." A few minutes later the sister-in-law flies in the door. "Can I see those sweaters? It doesn't matter that they're women's." She's giddy to have three sweaters to choose from. She picks a tan sweater with a green Christmas tree on the front and a brown moose on the back. "My husband will be so excited to have this sweater for his party." Another happy customer. I love this job. A new woman says, "I'd like to look at that Christmas creche in the cabinet." I pull out a boxed set with 15 pieces - Mary, Jesus, Joseph, the wise men. The whole enchilada. The box is worn but it looks like Mary and Joseph and crew have never been out of it. The woman inspects the plastic pieces for chips. "I'd hate to buy this creche for my daughter and then get stuck with it if she doesn't like it. I'll re-donate it if that happens, but she keeps telling me she really wants one." Three Hispanic women pile a mountain of clothes on the counter. Most items are one dollar or uno. A few are two dollars or dos. That's our bilingual exchange. I smile. They smile. Everyone's laughing. An Asian man comes in the shop, inspects some items on the Christmas decor table, and leaves. The woman with the jeans comes out of the dressing room. The Gloria Vanderbilt jeans are too big but another pair is perfect. I put the Vanderbilt jeans to the side and ring up her purchase. Those are really nice jeans she didn't buy. They're size eight. Hmm? When was the last time I wore a size eight? Do I dare try on these jeans when I'm through for the day? The Asian man comes back. He buys two Christmas ornaments. One for fifty cents and one for ten cents, plus tax. He gives me the exact change. Last sale of the day — a two-dollar Christmas ornament. I hope it's for an ugly Christmas ornament exchange. I don't say that. I'm in the dressing room with Gloria Vanderbilt. I look in the mirror. I turn around. I look again. I'm so excited I have to tell someone. I tell the manager. "Jennifer, the jeans fit." Sold for five dollars. And throw in a Christmas scarf for The Jazz. What a great store. It raises funds for FieldHaven. It gives exceptional value to the community. To me, it feels like home and a breath of fresh air. PATRICK'S FACEBOOK POST: Just love the feeling of creeping along in a parking lot, looking to the right at the empty spot you're about to pull into, when you hear the crunch of a collision from a pickup truck backing into you. Which is to say that I don't really like the feeling at all. The December surprise arrives. Actually, it's not a surprise. The surprise would have been if there were no surprise. Pat was in an auto accident yesterday. "Mom, it's a fender bender. It happened in a parking lot." He's called the insurance company. He's taking the car into a collision center for an estimate. "The other guy says we're both at fault. I might have a thousand-dollar deductible." Lord. Who might have a thousand-dollar deductible? I'll be the one who has the deductible. Pat says, "It's bad timing. I have a job interview in Davis tomorrow. I can't drive my car that far with the driver's side rear view mirror torn off." "Okay. Drive my car to the job interview." Pat arrives to pick up my car. He's printing forms for the DMV that the insurance company told him to fill out. They think it was the other guy's fault. Pat says his policy doesn't include rental car coverage while his car is being repaired. "Let me know what the insurance company decides and how the job interview goes." Pat looks handsome in his tan jacket, white shirt, and polished black shoes. My son's trying hard to get his life on track. I gaze at him in awe. He never gives up. This man, this son of mine, deserves a chance. Pat Calls. "I didn't get the job." That was fast. "What did they say?" "They had fifty-six applicants for five positions." "Well, it would have been a long commute." "I know, but I would have driven it." "The other insurance company is saying that we're both at fault. USAA is saying it's the other guy's fault. They may have to get a third party mediator." "Okay. Let me know when they make a decision." PATRICK'S FACEBOOK POST: My dog's defecation clock somehow got set to three a.m. this week. Guess it's good practice if I ever have a child. There are 13 people at the mental illness support group meeting today. One new person shares her story — long-standing and difficult. She's trying to get better services for her son. He hears voices. He says, "The voices are telling me I need to help them blow up the world or I need to kill myself." The woman's been unable to get an appointment for her son to see a psychiatrist. She's trying to get assistance from someone in a state senator's office. She's also collecting gloves, hats, and coats for the homeless. Her son stays in a grungy downtown hotel and she's concerned for those who don't have an inside place to stay in the 20-degree weather we're having. "Is your son still talking about killing himself?" "He says, 'Mom, I'm handling it. I told the voices I'd help them blow up the world. I called their bluff. They've quieted down.'" A marriage and family therapist joins the group for the first time. "I've worked with clients who have mental illness and I've worked with many families. I came today thinking maybe I could answer some questions or make some suggestions. I'm aware that everything said in this room is confidential. If I meet you the neighborhood, I won't acknowledge you unless you want me to." An elderly couple sits close to one another. She looks frail. He's been here before by himself. "I brought her today so she can listen and I'm here to support her." I ask, "Do you want to talk about anything?" We sit at a u-shaped table in a grocery store that lets us use a conference room once a month. Shoppers walk by the closed, folding plastic doors. They can see us but they can't hear us. Mental illness doesn't exist in this country. We hide it in plain sight. I've ordered Frozen dolls, Anna and Else, for Regan and Ayla. Have calls into Megan and Marisa to see if there's something I can send for Aidan and Ashton and Sam and Elise or if cash in a card is in anyway exciting. "How much do you want to spend?" I hate this question. It touches on issues behind issues behind issues. It verges into psychology, financial literacy, and emotional conditioning. It's one of the fundamental questions about aging on a fixed income. How do I make sure I don't run out of money too soon? How do I weigh living now versus living later? How do I discern when to splurge and when to save? I'm on the phone with Marisa. We're online for hours, trying to find a pair of pink, fluffy slippers for Elise. Who would think that pink, fluffy slippers would be difficult to find? Finally, we find slippers. They're not pink. They're not fluffy. They're brown with chocolate dots on them. Elise says, "They're good." Sam wants a Golden State Warriors beanie. That search takes a couple of minutes. The slippers and the beanie are both available on Amazon. Shipping times are good for Christmas delivery. Christmas gifts for two sets of grandkids down. One set to go. I'm waiting for a call back from Megan. Megan's on the phone. Aidan and Ashton need rubber bands for their Rainbow Looms. So, I'm sending money gifts to buy rubber bands and whatever else they want. My cousin, Annette, calls from Kansas City. Her son, Danny, recently met a man from Wayne County, Pennsylvania. The man says, "The county's crawling with Funks." Funk is my mother's family name. Danny's trying to get more information about possible, current-day relatives. Annette and I discuss a photo of an 1890s farmhouse. She and I both have copies. An unknown relative wrote on the back of the photo, "This is grandmother's house. On the porch is one brother, and on the lawn is another brother, and another brother is to the left." A reminder to give more specific information. This evening, as I slip under the covers, I'm thinking about my descendants. I want you to know dear children, grandchildren, great-grandchildren, and great-great-grandchildren, that I'm thinking of you. I hope this journal will give you a picture of life in the distant past - in the years 2013-2014. My "rainbow loom" uses words. With words, I'm trying to weave a big, warm hug that will wrap around you in the future. HERE'S A BIG HUG FROM MY NOW TO YOUR NOW. Love, Mom, Mim, Great-Grandma, Great-Great-Grandma. beneath it; the whole story doesn't show.